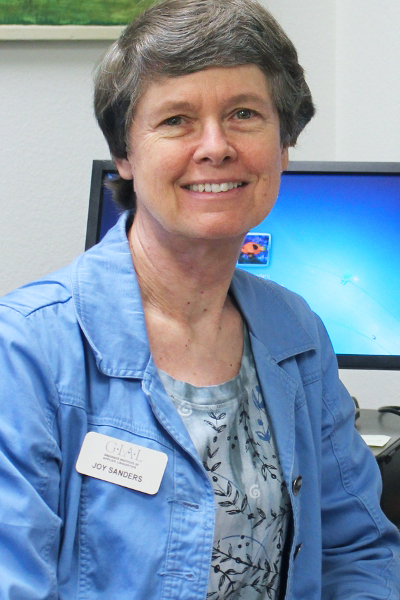 Joy Sanders, wife to Professor Arden Sanders, greatly enjoys teaching Phonetics here at Dallas International. Her openness and enthusiasm for class content is evident to her students, as is the richness of her extensive and ongoing cross-cultural experience. Joy spent many evenings of her growing up years sitting around her family’s table, listening to the stories of cross-cultural workers who stayed in her home. Ken Pike (for whom Dallas International’s library building is named) stayed at her house, and Florence Gerdel, a cross-cultural worker in Columbia, took an early interest in Joy, writing to her regularly. In high school Joy took a six week linguistics summer course and loved it. After training as a nurse and taking Greek and Bible on the side, Joy submitted her Wycliffe application. She met her husband at Summer Institute of Linguistics and they came to SIL Dallas in ’74 where they finished their Master’s degrees. Joy and Arden then moved to Papua New Guinea, where Joy helped the people learn to read in their own language. She also helped with some translation checking. As each book of the New Testament was translated she would sit with a group of women and read it through. Hearing them read and understand it for the first time was so meaningful; sometimes the women would weep when first reading about Jesus. Joy has been here at Dallas International since 2002. Ask her what her favorite part of her job is and she says in no time at all, “The students!” What she loves about Dallas International is that there are relationships in all directions, including between students and staff. She describes the school as a family. Joy has a part-time job teaching adults to read and write. She loves to see people reach their full potential. Joy is also passionate about language documentation. She is currently working on the documentation of the Kamasau language and culture using audio and video recordings gathered in 2014. She is archiving them with SIL’s language and culture archive. The Kamasau dictionary is now accessible online at: www.kamasau.webonary.org. The site includes drawings of cultural items by a national artist, plant photos, and a few audio recordings of individual words.